I think I need some help with my flashes (sb900 and sb910's) and CLS mode. I want to trigger them with flash on camera, but still wan't to use that on-camera flash as TTL for fill light. I want to trigger those two flashes on stands. So, I put flashes on stand to remote position, the one on camera leave as it is. But somehow, on-camera flash won't trigger those two on stands. What am I doing wrong? If I change on-camera flash to master and than change settings on flash (for group B and channel 1 as in CLS camera menu), everything works. But I don't wan't to use it that way since it is too slow to set and change things. I'd just like to be able to switch CLS on/off to change on-camera flash from "TTL bounce" to "TTL bounce and trigger B group". Any idea, what am I doing wrong? I have no clue about Nikon, but I would check to see what the flash on camera is doing irregardless of what you have the menu set too. I have a suspicion that the main on camera flash is not sending signal. In other words, not acting as commander. Do you need to set the on camera flash to commander? Or set the channel on the flash itself? Hmm, I am not sure what I am doing wrong. I previously owned D700 and it was everything simple. But I do not remember if on-camera flash had any specific settings or if it must have been "master". IMO it should work in "normal" (only turned on) if CLS is ON. I've tried to look on YouTube, but there are only videos where they trigger with camera's built-in flash. The wording is slightly confusing to me. In that image, it says "E3 Flash cntrl for built-in flash"
Which is it? Actual built in flash in your camera, or a dedicated hot shoe flash on camera. I would assume you put the Dedicated Flash ON Camera in 'Master' Mode, just makes sense to me and the others would be Slave? I've never used that way of shooting in my life so I cannot tell you specifically, always had Off Camera Flashes firing via a trigger, InfraRed in the 'old' days, and wireless last 10+ years, even use an On Camera Flash as the Trigger is mounted on a plate to underside of body via the Flash Sync Cord, so I can have the best of both worlds. Well, I assume that if I don't put sb900 on camera, this CLS is used for built in flash, but If I put Flash up, it works with it. If I remember correctly, with D700 worked that way. Just can't figure it out why here is problem. 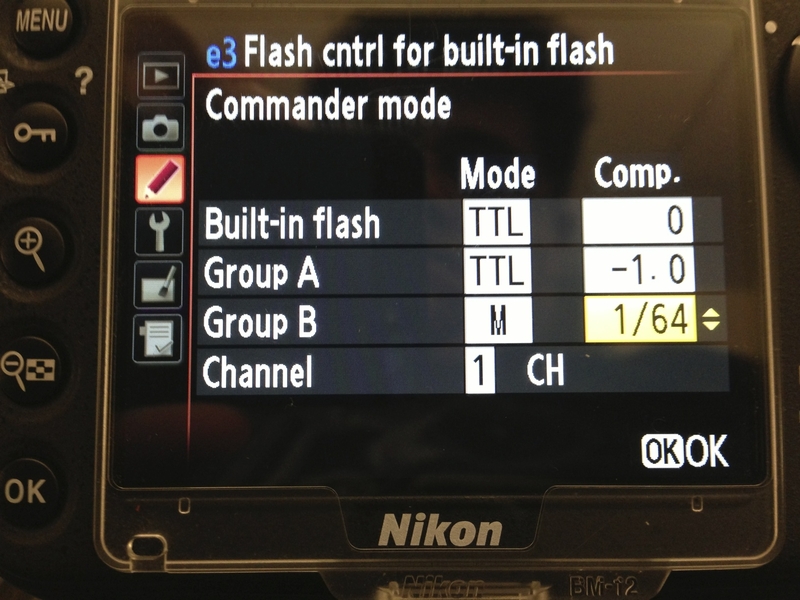 When you use a speedlight on the camera as the master, you have to use that flash's menu to set everything up. At the moment you are looking at the pop-up flash as the controller.